Trump’s comments can only inflame a situation of acute tensions following the test launching of two long-range North Korean missiles last month and the imposition of punitive UN Security Council sanctions that threaten to cripple North Korea’s economy. For Trump to threaten to reduce the small impoverished country to ashes is the height of recklessness. Trump has deliberately undermined the efforts of US Secretary of State Rex Tillerson over the past week to lay the basis for negotiations by reassuring North Korea that the US is not seeking regime-change or a pretext for launching a military assault. The unstable, crisis-ridden regime in Pyongyang can only assume that it faces an imminent and massive attack by the United States. It is responding with its own bellicose rhetoric. In a statement yesterday, North Korea declared it was “examining the operational plan” to strike US bases on Guam with medium- to long-range ballistic missiles. Such threats play directly into the hands of the Trump administration by providing the excuse for the US to carry out pre-emptive strikes against North Korea. Not since the Cuban missile crisis of 1962 has the world stood so close to the brink of nuclear war. An incident or accident, whether minor or major, could trigger a conflict that rapidly draws in other nuclear-armed powers, such as China and Russia, with incalculable consequences. 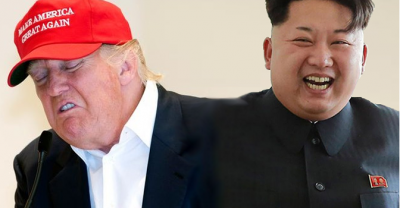 Unlike 1962, when US President John Kennedy sought to defuse the crisis and overruled the demands of his fascistic Air Force chief of staff, General Curtis LeMay, to bomb Russian missile sites in Cuba, Trump is intentionally escalating the North Korean crisis. His threats are unprecedented for a US president. One is compelled to go back to the fascistic rants of Hitler to find any parallel. No one should dismiss Trump’s statements as empty rhetoric. By threatening North Korea with annihilation if it carries out further tests, Trump has created a situation where it is impossible for him to back down. Moreover, such is the intense crisis and infighting in American ruling circles that Trump may be driven to launch a reckless attack on North Korea as a means of diverting attention from the political turmoil at home. The Trump administration, assisted by a servile media, is already ramping up a propaganda campaign aimed at stampeding American public opinion into believing that US cities are in imminent danger of a nuclear attack from North Korea. These claims come from the same American intelligence establishment that forged the lies about weapons of mass destruction used to justify the illegal invasion of Iraq. They cannot be taken at face value. Everything about North Korea’s so-called ICBMs remains in question, including their range, accuracy, warhead load and ability to survive re-entry into the earth’s atmosphere. Trump is utterly indifferent to the immense loss of life that would result from a war with North Korea. Even if the conflict were limited to the Korean Peninsula, the number of deaths would run into the millions. According to one estimate, the population of the South Korean capital Seoul alone would suffer a million casualties in the first hours of the fighting. Speaking on the NBC “Today” program last week, right-wing Republican Senator Lindsey Graham gave a chilling insight into Trump’s thinking. Graham declared that war was “inevitable” unless North Korea halted its missile tests—in other words, completely capitulated to US demands. The acute danger of war in Asia is not simply the product of the fascistic individual Trump, but expresses the profound and insoluble crisis of global and American capitalism. US administrations—Republican and Democratic alike—have resorted to military aggression in a desperate bid to reverse the protracted decline of American capitalism and establish its global dominance. A succession of wars in the Middle East, North Africa and Central Asia is now coalescing into a direct confrontation between the world’s major economic powers. The Obama administration’s “pivot to Asia” involved an enormous military buildup throughout the Indo-Pacific in preparation for war against China—the central target of US threats against North Korea. In Europe, the US is involved in one military exercise after another as it prepares for a military confrontation with Russia, which is engaged in its own extensive war games. In the Middle East, the US and Russia are militarily involved on opposing sides of the Syrian conflict. Any one of these flashpoints could become the trigger for war between nuclear-armed powers that would kill millions, if not billions, of people and destroy civilisation as we know it. This extraordinarily tense situation is extremely serious. Workers around the world cannot afford to wake up in the morning to find that the US has launched massive attacks on North Korean military installations and industry, that Pyongyang has retaliated by hitting Seoul and Tokyo, and that China, Russia and the other major powers are issuing their own threats and putting their nuclear arsenals on high alert. The urgent task facing the working class is the building of an international anti-war movement based on a socialist program to put an end to capitalism, the root cause of war. That is the political perspective for which the International Committee of the Fourth International and the World Socialist Web Site are fighting. Featured image is from Stubhill News.